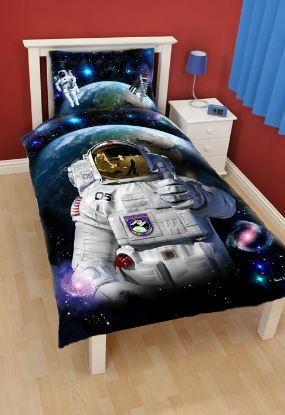 Space has always fascinated me since I was a little girl and I would have most definitely had a space themed bedroom, if I was able at the time! But I suppose the theme of “space,” is normally thought of as more typically a boys interest, but I certainly know of plenty of little girls who are interested in Space, just like I was. Space is amazing, mysterious and magical – and it’s certainly an interest for everyone! 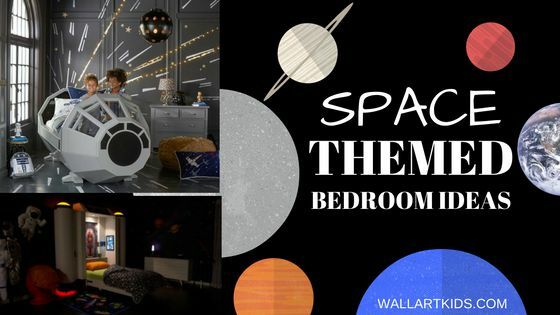 In this post, I’m going to share with you a few space themed bedrooms that have inspired me and then I will share some individual products that may help you create that Space look! If you’re able to have a custom designed room, there are some amazing options available – check out this awesome spaceship! 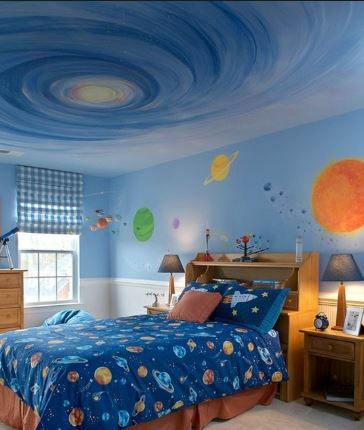 Simple layout, but a great emphasis placed on painting the walls and ceiling, then just the added space themed duvet to complete the look. 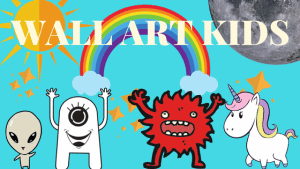 If you have an artist in your family, maybe they could have a go at creating a space scene for you! 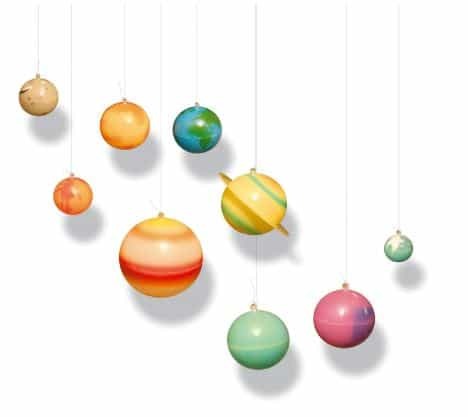 I just love this, look at these awesome 3D planets coming out of the wall. The planets emerging from the wall and the brilliant astronaut just create an awesome realistic effect. 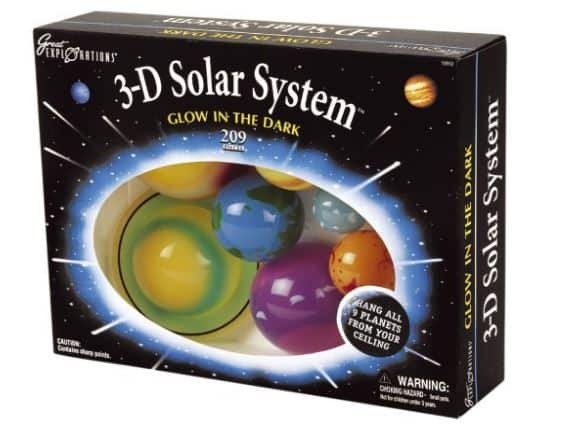 You can purchase the 3D planet set here at Spectrum Scientifics. 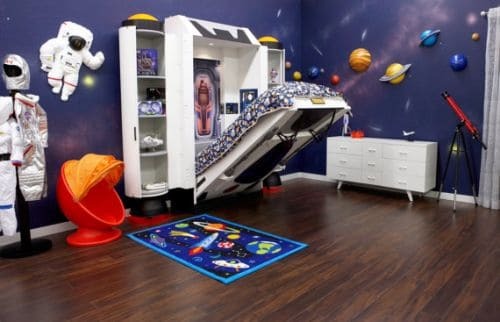 This is an amazing Space themed bed, this isn’t one for those on a strict budget, but if you’re looking for the wow factor, this is certainly an option. A single cabin bed, with space underneath for a work space, den, or extra sleeping space for sleepovers! The ladder is camouflaged by the “rocket” blasting into space, complete with an LED light for added realism. Each bed is made to order from knot-free Scandinavian pine. 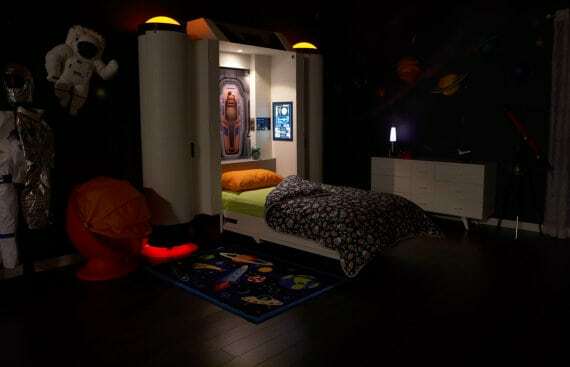 This bed is truly unique, what an awesome spaceship bed! Carefully designed so that the bed can be hidden back into the wall and kept away during the day, this bed would be a super space saver, as well as an all round show stopper. The one hand operated mechanism that raises the bed is completely safe and can be used by children. Made in Canada, but also ships to the US. 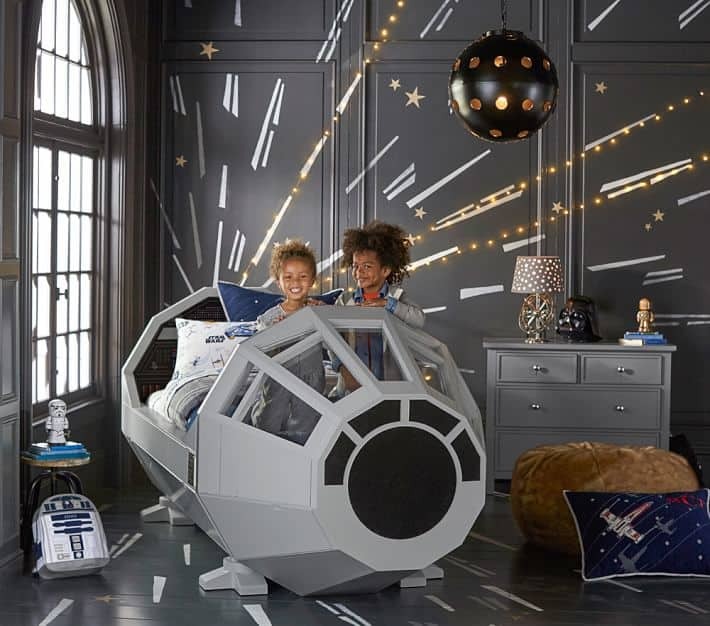 Another gorgeous design, this time following more of a Star Wars Theme – created with a Millennium falcon cockpit shape, there are visible controls and buttons on the inside. Hand painted and hand crafted with sold wood. See it here. Space Themed Accessories & Extras! 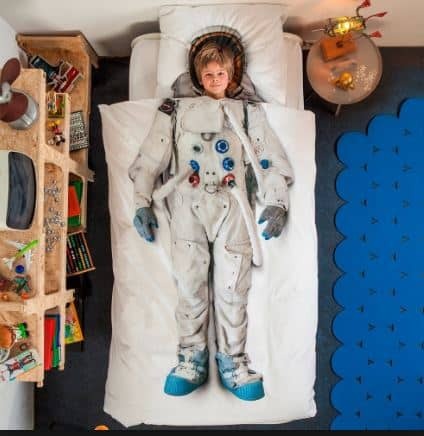 I love this adorable bedding set – a super one for any little space enthusiast, or particularly if your child dreams of being an astronaut one day. A cute Space rocket lighshade. It also comes with bulb included, very easy to install and looks great. 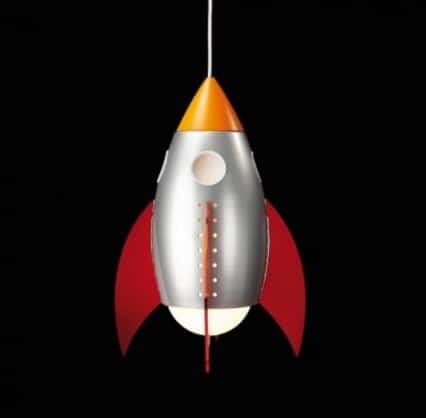 Would make a super addition to your Space room! Possibly one of the most brilliant lamps I have ever seen. 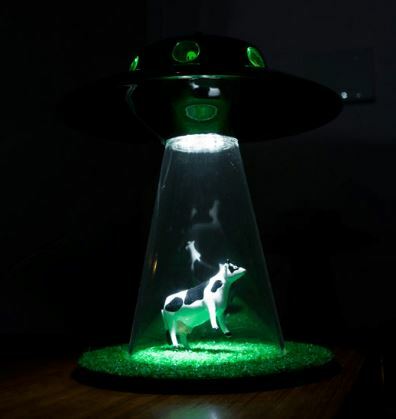 A UFO attempting to abduct a cow, that floats in the beaming rays. Unfortunately, this item is currently unavailable, but the creators do say that if they receive enough messages asking them to create more, they may well do!! You can contact them here! Moon In My Room Light! 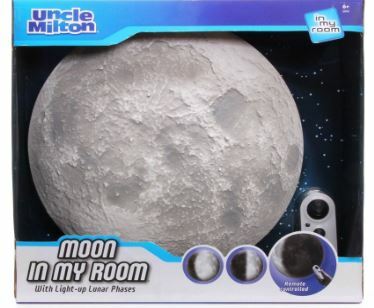 This cool Moon night light, would make a brilliant edition to any spaced themed room. You will be able to see the 12 phases of the moon either automatically or manually. You can also download an informative moon tour. 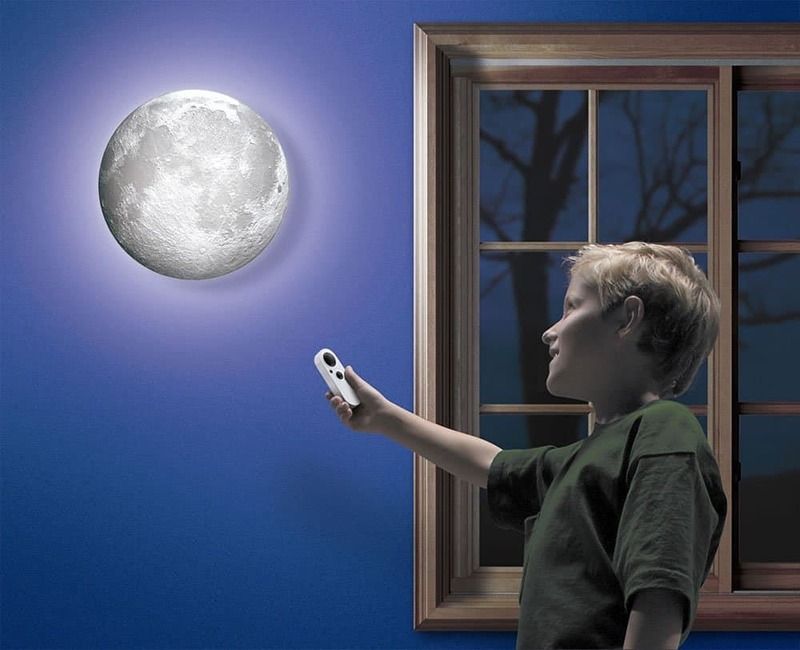 Really simple controls, so your child can easily change the moon settings themselves. Will create a lovely atmosphere in the room. 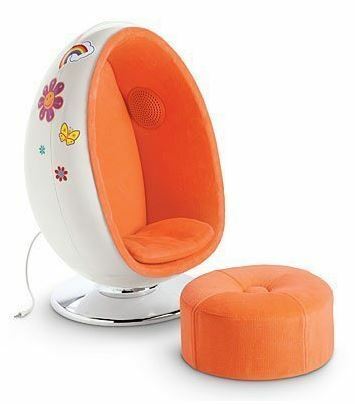 Gotta love the classic style egg chair and this one comes with working speakers, that can be attached to whatever music player is currently being used – such as an ipod. Pretty groovy eih? Also comes with a matching foot rest and some 60’s style decals to decorate your egg! 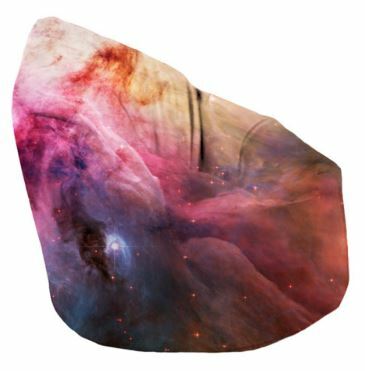 Alternatively, how about this Galaxy beanbag chair? Nice and cosy to sit on, there are a variety of galaxy patterns available. 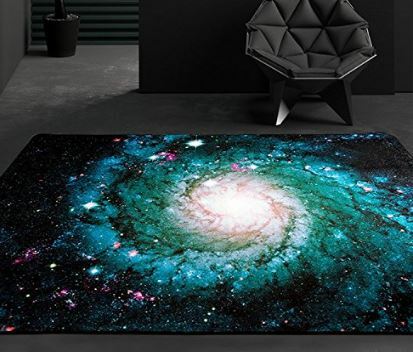 You can even bring space to your floors, a space rug like this would make a big impact. A variety of sizes available! 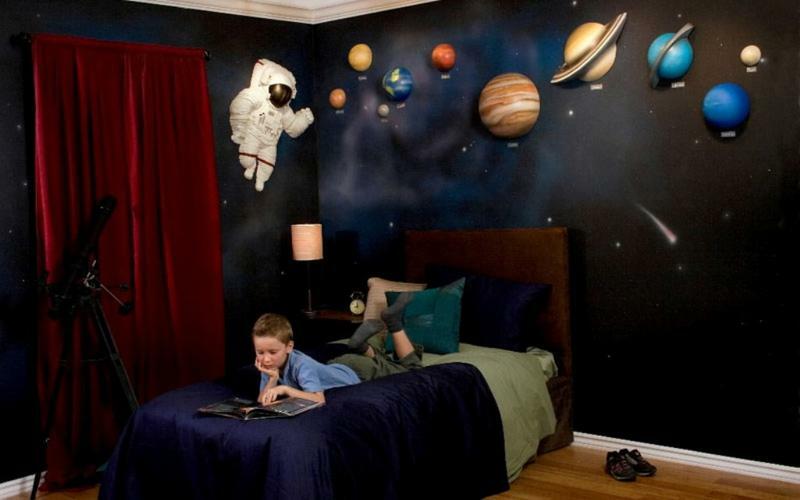 You can’t have a space themed bedroom without planets now can you! Don’t these Space lights look great…. You can hang them from the ceiling and they even glow in the dark! 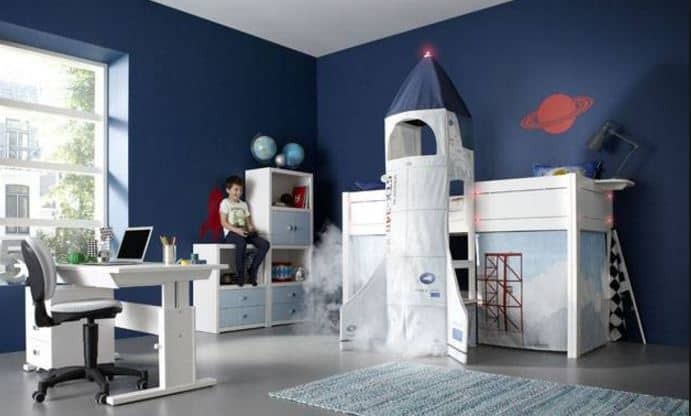 Complete with 9 planets and 20 glow in the dark stars – my own kids have this exact set and they look great. 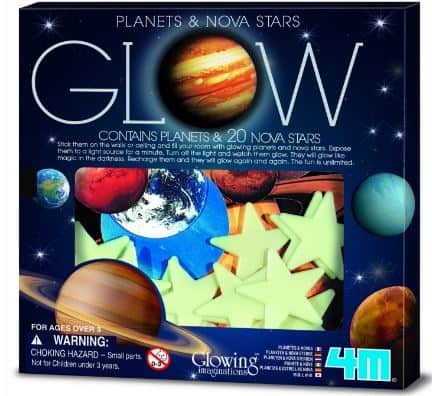 The paper planets don’t glow and you need to ensure you “charge” the stars by exposing them to bright natural sunlight initially, which charges them. They will then glow! Wall stickers are so cost effective and easy to use, yet they can make a giant impact. Like this wall sticker above, that looks like a window looking out into space. 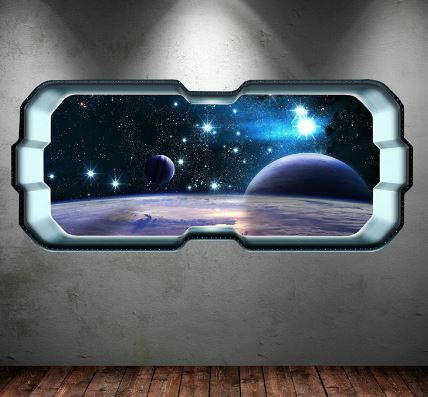 You can also check out my space wall sticker dedicated page. 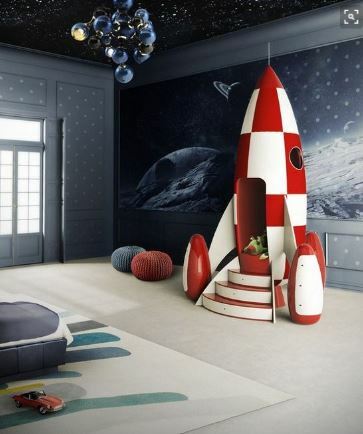 That about concludes my post on Space themed bedrooms today!